It sounds something like a paradox, but tiny optical fibers (their diameter being comparable to that of a hair) are nowadays a powerful tool in the hand of astronomers to make discoveries on the largest structures in our Universe, such as galaxies and their clusters. 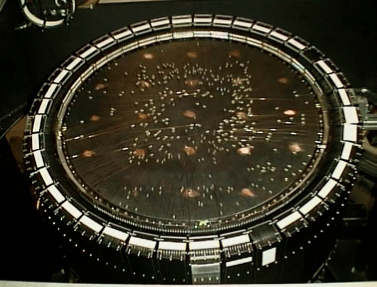 Image of the focal plane plate of the 2dF instrument featuring magnetic 400 robotically positionable buttons collecting the light of the galaxies and delivering it to a spectrograph via optical fiber. Credit: Anglo Australian Observatory. About 35 years ago, it was realized that a bundle of optical fibers could be used to improve by orders of magnitude the productivity of a spectrograph. In the pioneering instrument MEDUSA , up to 32 fibers were placed in the focal plane of the telescope and used to collect the light of different objects and deliver it to an imaging spectrograph, which could image on a camera each of the 32 spectra. With MEDUSA, it was possible to collect spectra from many different objects in about the same time previously employed for the recording of a single spectrum. The difficulty with multiple-object spectrographs of the MEDUSA-type was to place the fibers in the correct position before the observation. This was simply done by fixing manually the fiber ends to holes in a metallic plate, drilled in the expected position of the object. Soon afterwards, robotic fiber-positioners were developed to reconfigure automatically and in a shorter time the instrument, giving astronomers the key for large spectroscopic surveys of galactic and extragalactic objects. In the late 1990s, the state-of-the-art multiple object spectrographs like 2dF at the Anglo Australian Observatory used as many as 400 robotically-positioned fibers (see figure above). A spectacular result of the instrument was the completion in the early 2000s of the 2dF galactic survey, in which the spectra of some 200,000 galaxies were analyzed to measure the redshift, and thus their distance. The survey revealed for the first time the details of the three-dimensional distribution of matter in the local universe (see figure below), giving the astronomer the possibility to test concurrent cosmological theories . The structure of the local universe as determined by the 2dF survey. Each yellow dot represents a galaxy. Credit: Royal Observatory Edinburgh. The development of MEDUSA and 2dF can be regarded as early examples of Astrophotonic instruments, that is, astronomical instruments which make use of advanced photonic technologies to improve their performance. Initially, Astrophotonic instruments were developed in the frame of spectroscopic techniques, but in recent years other techniques have benefitted from the advantages offered by photonic solutions. A remarkable example is the case of high-resolution imaging techniques like astronomical optical interferometry. Astronomical interferometers are complex instruments which combine simultaneously the light from an array of small/medium size telescopes to synthesize a virtual telescope with an angular resolution equivalent to that of a monolithic, ideal telescope with a diameter equal to the largest distance between telescopes in the array (usually in the order of a few 100 meters). At the heart of state-of-the-art astronomical optical interferometers, we find again micro-photonic components like optical fibers and integrated optical circuits, which ‘clean’ the spatial profile of the light collected by the single telescopes and eventually combines it on-chip. For instance, the instrument PIONIER at the Very Large Telescope Interferometer (VLTI) in Chile features an integrated optical chip combining simultaneously infrared light collected from up to four different telescopes . The chip is probably the most complex integrated optical component ever manufactured, and accomplishes within a few square centimeters the task of a square-meter-footprint conventional optical setup, albeit with higher thermal and mechanical stability. With PIONIER, interferometric high-resolution imaging of disparate astronomical objects like star surfaces, close binary stars, and proto-planetary disks (see figure below) has become routinely available to astronomers . The same photonic technology powering PIONIER will be also at the heart of GRAVITY, a more complex, next-generation interferometric instrument for VLTI which aims at characterizing for the first time the accretion disk of the black hole at the center of our galaxy. 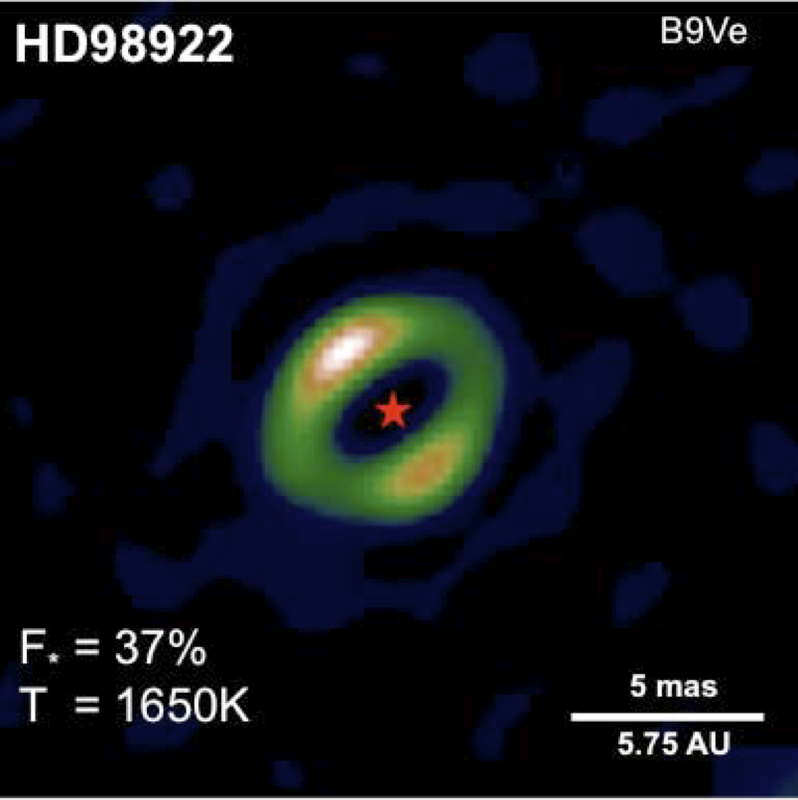 High-resolution image of the debris disk surrounding the young star HD98922 based on observations with the PIONIER beam combiner. Credit: J. Kluska, 2014. In the near future, Astrophotonics (the branch of Photonics dealing with astronomical applications) promises to enable even more advanced, miniaturized instruments which could perform complex manipulations of the photons collected by the telescopes, and allow even more exciting discoveries in astronomy. Current trends in the Astrophotonic research include the development of phase-masks coronagraphs for direct detection of exoplanets, complex fibered notch filters for the suppression of atmospheric emission, development of integrated optics micro-spectrographs, exploitation of 3D-integrated optics for astronomical interferometry, laser guide stars, and frequency combs for exoplanet hunting. 1 – J.M. Hill et al. “Multiple object spectroscopy: the MEDUSA project” Astroph. J. 242, L69 (1980). 2 – Peacock et al. “A Measurement of the Cosmological Mass Density from Clustering in the 2dF Galaxy Redshift Survey” Nature 410, 169 (2001). 3 – J.B. Le Bouquin, et al. “PIONIER: a 4-telescope visitor instrument at VLTI”, Astron. Astroph. 535, A67 (2011). 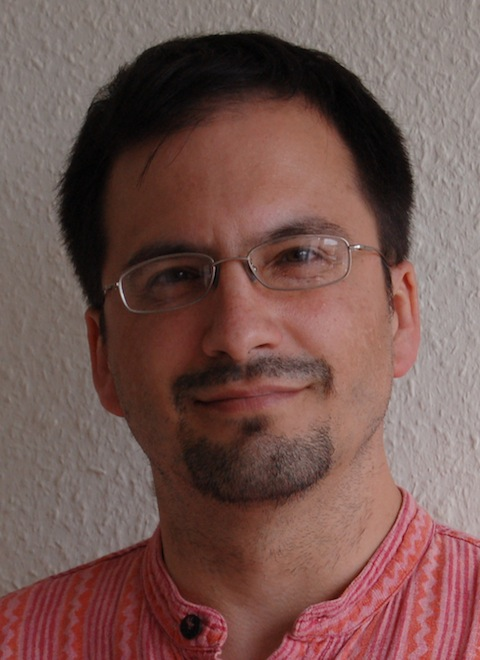 Stefano Minardi is currently a senior scientist at the Institute of Applied Physics of the University of Jena, Germany. His research interests range from fundamentals and applications of nonlinear optics to Astrophotonics. In the latter field, he is currently working at the development of 3D- integrated optics beam combiners for astronomical interferometry, and broadband phase-masks for high-performance stellar coronagraphy.